Insect screens made from stainless steels are commonly used in HVAC systems to prevent migration of insects across the space. Usually stainless steel insect screens are used as a biosecurity system in standard facilities or lab areas that demand physical protection from insects. Standard applications for stainless steel insect screens include quarantine facilities, insectariums, research labs and hospitals. The insect mesh screens are made from stainless steel 316. They are also used for greenhouses and can be fit into any frame to suit the specific requirements. Considering installation of insect screens, they are very easy to install. The screens can be fixed directly to the studs in the holding frame and secured with stainless steel wing nuts. Or the screens can be mounted to the holding frame by using a holding tab method that includes the use of studs and clamps. Heanjia has developed insect screens by using high quality materials to provide outstanding performance, this has achieved the company an excellent reputation over the years. The impressive range features a wide range of insect screens in different varieties to suit all kinds of different applications. Select from a large selection of material types that include stainless steel and aluminum. Both insect screen materials introduce their unique set of advantages and benefits. Cost-effective choices, versatile for easy installation, outstanding visibility through the screen and long life. The insect screens allow excellent visibility and airflow. They are made in super fine mesh size to meet your needs. Where the construction of new buildings, modifications and additions are performed, insect screens are needed to be installed in windows and doors. Heanjia is a trusted and respected manufacturer of mesh screens in the industry. Whether you need pre-cut rolls to the customer, repairing screens at your place, we will help you. We are a professional manufacturer of insect screens to provide a full line of screens for your application. These screens are made from aluminum or stainless steels. The screens are smooth in touch and have a sturdy structure at the same time. They always protect your place from insects and are highly stable to sagging. These screens also offer excellent wind resistance. The screen frames can have handle section and shock absorbers to provide a smooth movement. 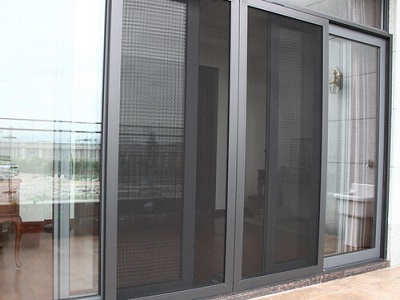 Heanjia provides a perfect solution for screening single or double doors in any design. The mesh screens are available in standard sizes and can also made in tailored specifications. These screens combine beauty and function to offer a versatile, reliable and advanced solution to screen oversized or large openings. The screens can be installed horizontally to allow window opening from one side. The unique mesh systems allows entry and exit with nominal effort and allows you to have fresh breeze and views of the outdoors without needing to worry about insects entering your place. The professional insect screen factory offers mesh screens that come in greater flexibility of indoor climate control with natural ventilation and brighten your place by allowing natural light in.